Here's a picture of the collage pendant necklace project I'm going to tackle. The project comes from a wonderful book I bought recently. 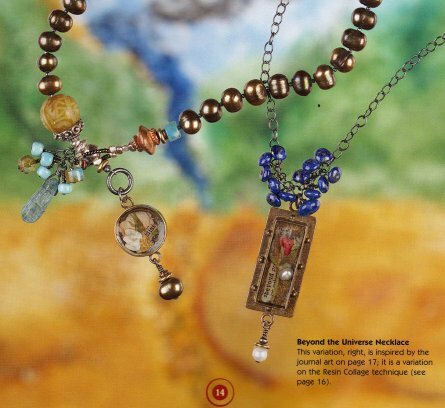 The book is called "A String of Expression, Techniques for Transforming Art and Life into Jewelry" by June Roman. This isn't a beginners book. It's more of a personal journey with some advanced techniques sprinkled in. I love it. It addresses some of my personal design challenges. For example, I love assymetry, but I have trouble balancing my designs. June addresses it with some words of wisdom, some tips and advice that even my little pea-brain can understand. Making something called an "infiinty twist"
Gosh making this list makes it sound almost mundane! A String of Expression is anything but. It's a really good solid book with beautiful picture and designs that are sure to spark hidden creativity and ideas buried within you. Please, support June Roman, jewelry artist, who sounds so sweet and lovely, and get her book if you can. Everything else, I already have (I think!) Wish me luck!